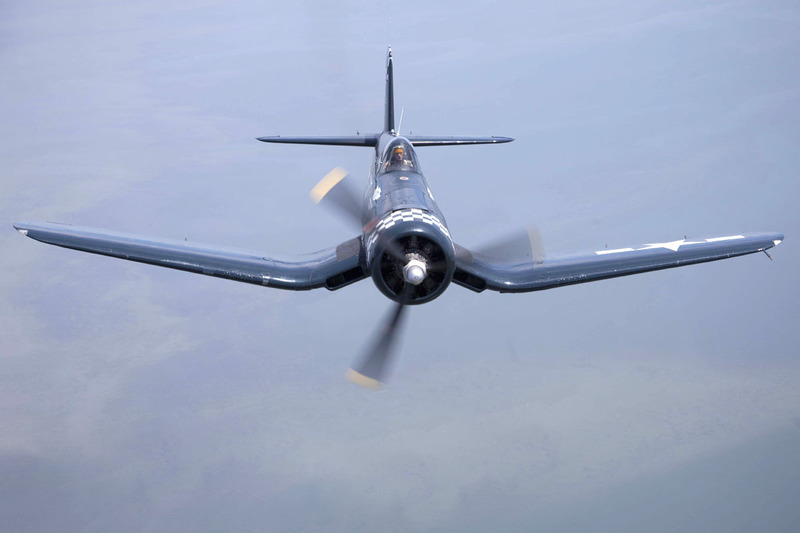 The Vought-Sikorsky F4U Corsair was an American fighter aircraft that saw service primarily in World War II and the Korean War. 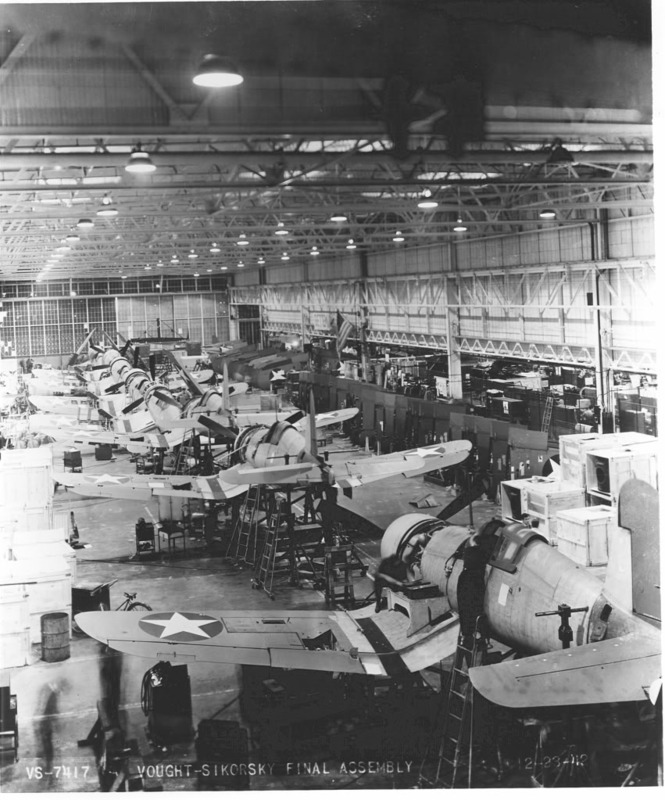 Demand for the aircraft soon overwhelmed Vought's manufacturing capability, resulting in production by Goodyear and Brewster. 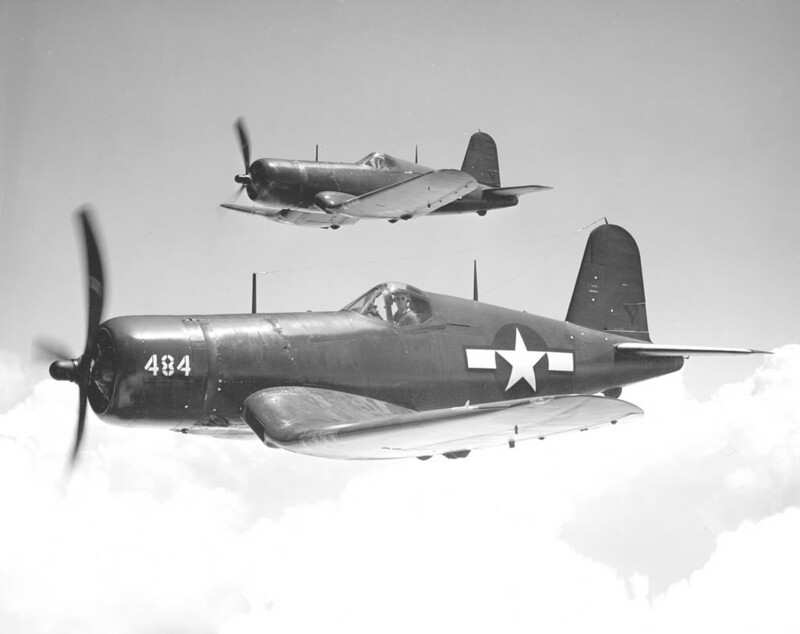 Goodyear-built Corsairs were designated FG and Brewster-built aircraft F3A. 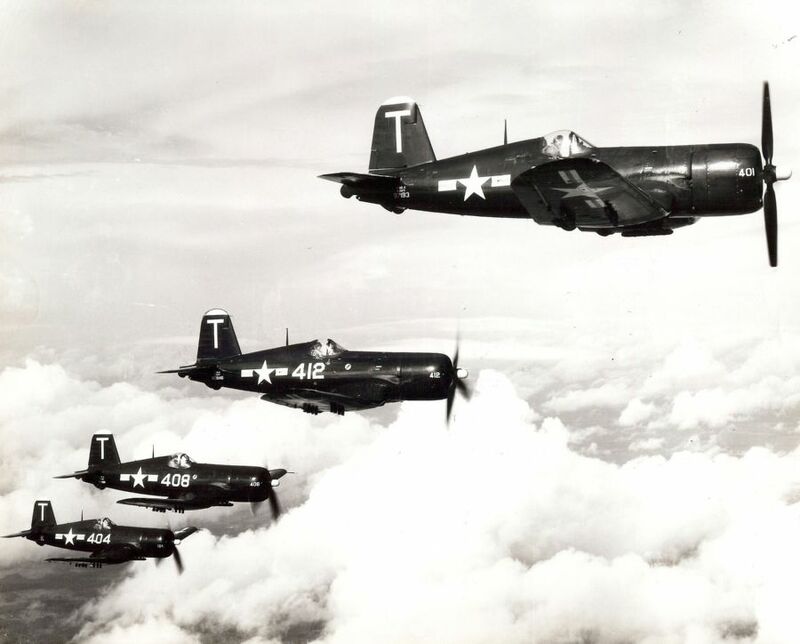 From the first prototype delivery to the U.S. Navy in 1940, to final delivery in 1953 to the French, 12,571 F4U Corsairs were manufactured by Vought, in 16 separate models, in the longest production run of any piston-engined fighter in U.S. history (1942–53). 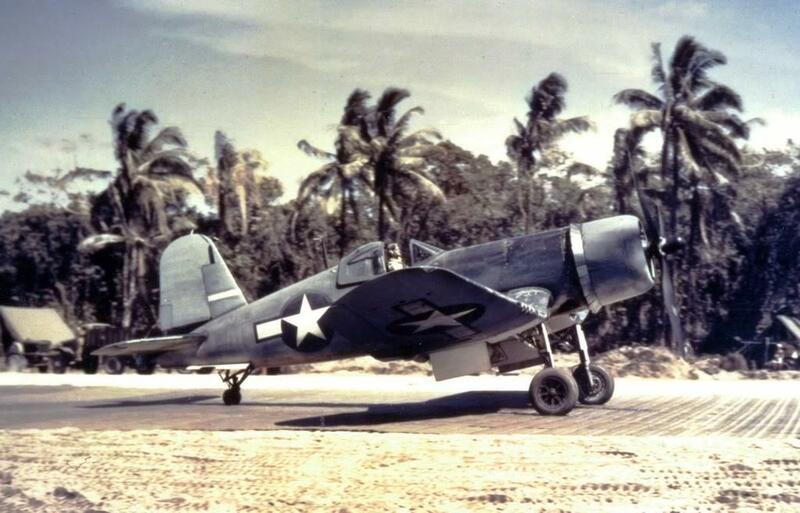 The Chance-Vought F4U Corsair first flew on May 29, 1940. 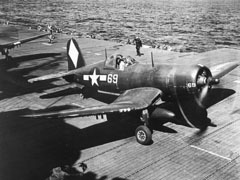 The fighter was designed as a carrier-based aircraft. 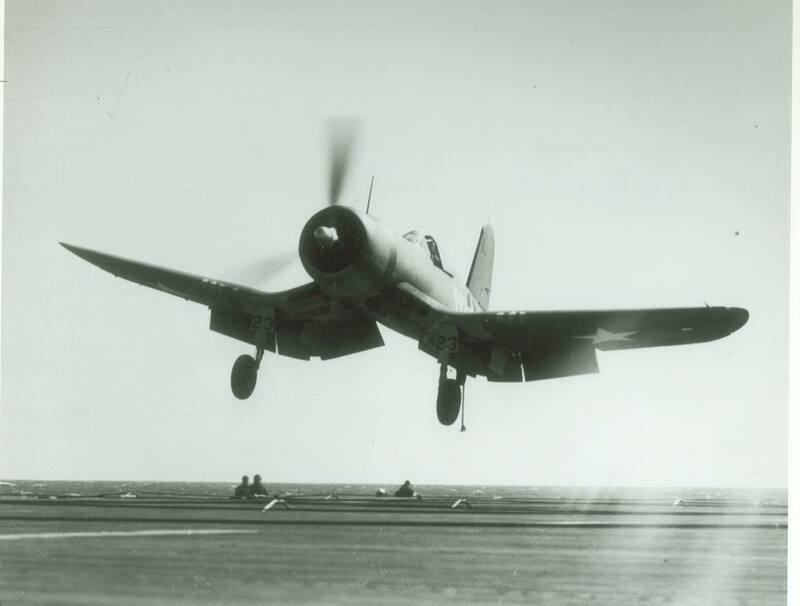 However its difficult carrier landing performance rendered the Corsair unsuitable for Navy use until the carrier landing issues were overcome when used by the British Fleet Air Arm. 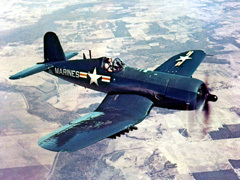 The Corsair thus came to and retained prominence in its area of greatest deployment: land based use by the U.S. Marines. 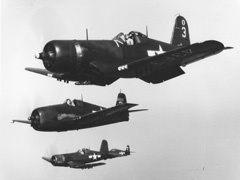 The role of the dominant U.S. carrier based fighter in the second part of the war was thus filled by the Grumman F6F Hellcat, powered by the same Double Wasp engine first flown on the Corsair's first prototype in 1940. The Corsair served to a lesser degree in the U.S. Navy. 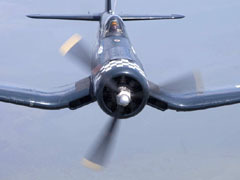 As well as the U.S. and British use the Corsair was also used by the Royal New Zealand Air Force, the French Navy Aéronavale and other, smaller, air forces until the 1960s. 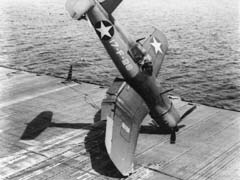 Some Japanese pilots regarded the F4U Corsair as the most formidable American fighter of World War II, and the U.S. Navy. 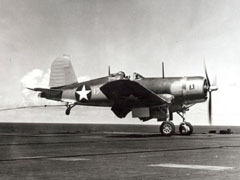 After the carrier landing issues had been tackled it quickly became the most capable carrier-based fighter-bomber of World War II. The Corsair served almost exclusively as a fighter-bomber throughout the Korean War and during the French colonial wars in Indochina and Algeria. 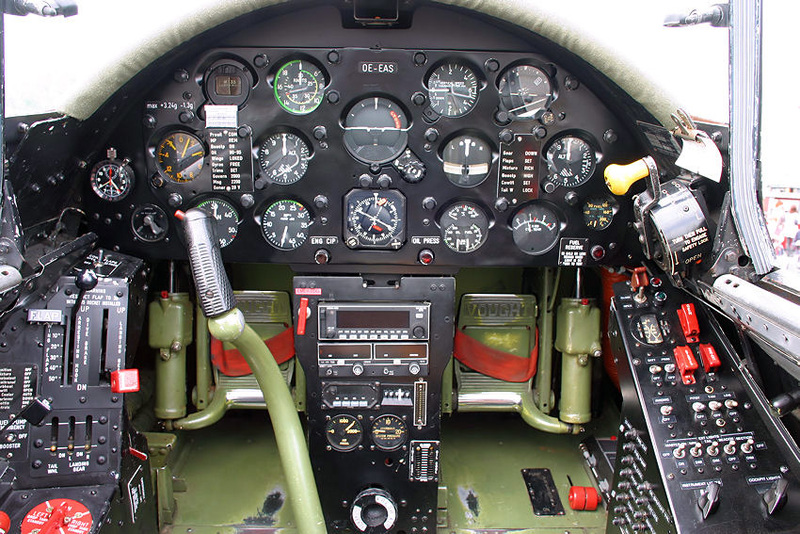 Over the decades, the Vought name has traversed an interesting, yet convoluted corporate maze. The industry dominance of its large parent companies, have invoked anti-trust laws more than once, and it has seen a myriad of corporate buyouts. 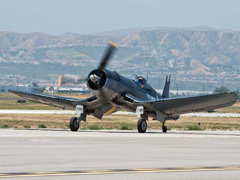 Vought now belongs to the Triumph Group, an aerospace component manufacturer. It operates as Triumph Aerostructures - Vought Aircraft Division, making aft fuselage sections for the Boeing 787 Dreamliner. 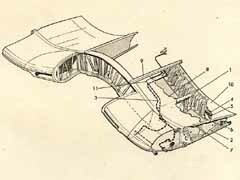 The Lewis and Vought Corporation was founded in 1917 and was soon succeeded by the Chance Vought Corporation in 1922 when Birdseye Lewis retired. 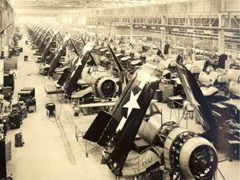 A former chief engineer of the Wright Company, Chance M. Vought founded the company to take advantage of the growing field of military and civilian aviation after World War I. Operations began in Astoria, New York and in 1919 were moved to Long Island City, New York. 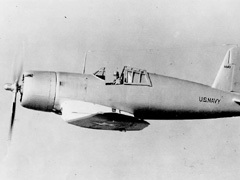 Vought died from septicemia in 1930, but in that short time period succeeded in producing a variety of fighters, trainers, flying boats, and surveillance aircraft for the United States Navy and the United States Army Air Service. 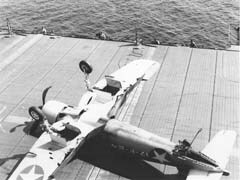 Vought made history in 1922 when their Vought VE-7 trainer made the first takeoff from the deck of the USS Langley, the first American aircraft carrier. 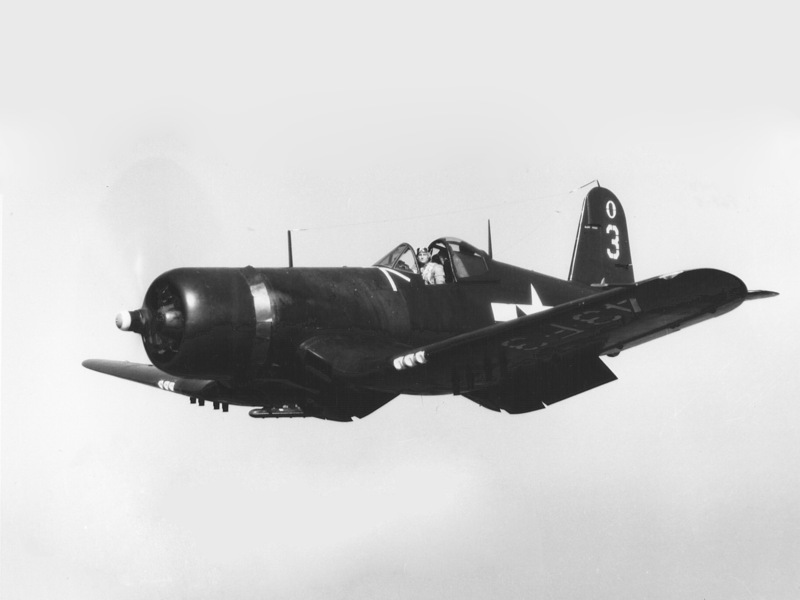 Following this success came the VE-11 naval fighter and the Vought O2U Corsair, the first of the Corsair aircraft. 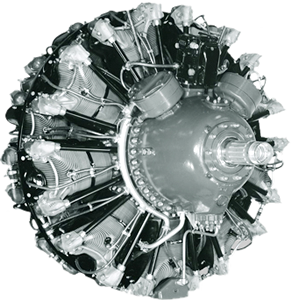 In 1928, the company was acquired by United Aircraft and Transport Corporation, but stayed its own separate division among the likes of Pratt & Whitney and Boeing. 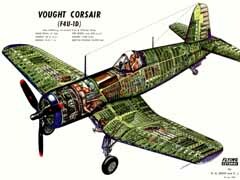 Despite the Great Depression, Vought continued to design and manufacture aircraft at a growing pace. 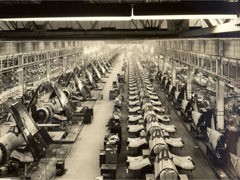 Soon after Chance Vought's death in 1930, the company moved its operations to East Hartford, Connecticut. 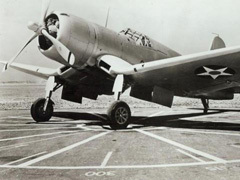 Under the Air Mail Act of 1934, United Aircraft and Transportation Corp. was forced by law to divide its businesses, resulting in Boeing Aircraft, United Airlines, and the United Aircraft Corp, of which Vought was a part. 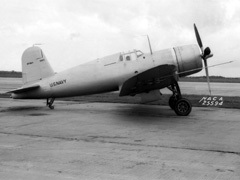 In 1939 United Aircraft moved Vought to Stratford, Connecticut where their Sikorsky division was located and renamed the merged divisions Vought-Sikorsky Aircraft. 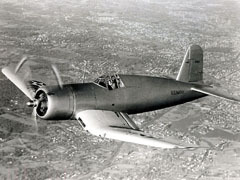 Chief Engineer Rex Beisel began in 1938 to develop the XF4U, recognized by its distinctive inverted gull wings. 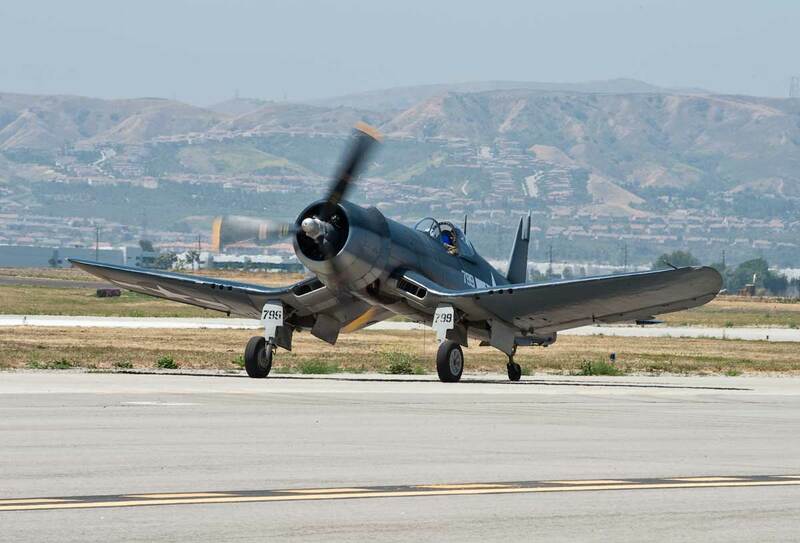 After its first flight in 1940, thousands of F4U Corsairs were produced for the Navy and Marines in World War II. By the end of its production in 1952, Vought, Goodyear, and Brewster had all produced the Corsair fighters. 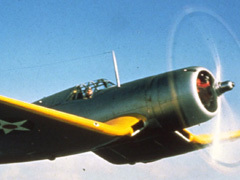 Vought was reestablished as a separate division in United Aircraft in 1942. 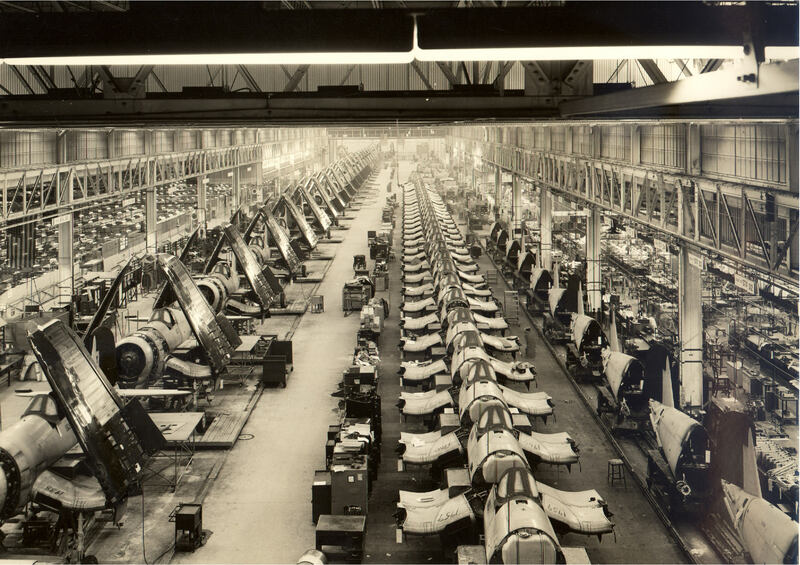 1917 Lewis and Vought Corporation is founded by Birdseye B. Lewis and Chauncey "Chance" Milton Vought in Astoria, NY. 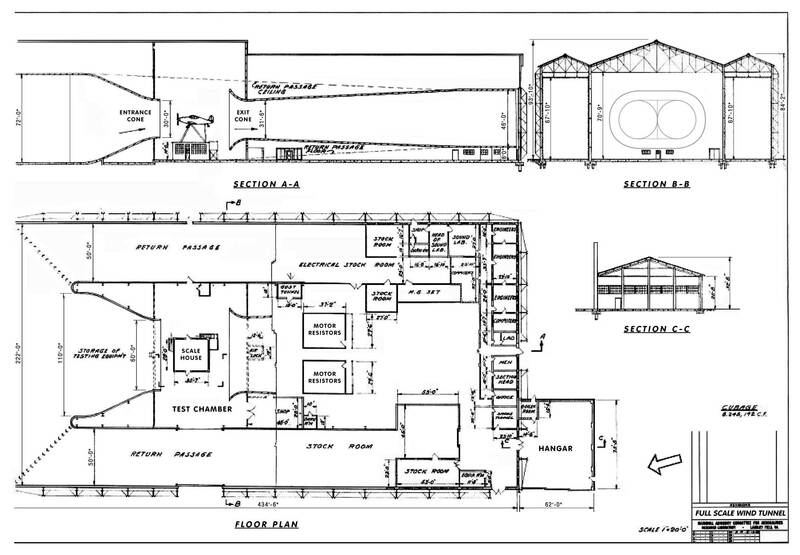 1918 Lewis and Vought Corp. moved to Long Island City, NY. 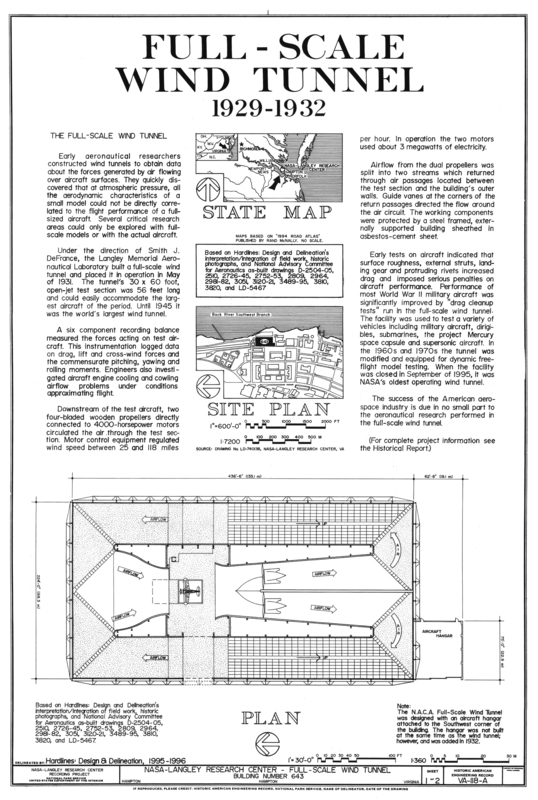 1922 Lewis and Vought was reorganized as the Chance Vought Corporation when Lewis retired. 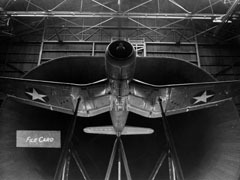 1929 Renamed Chance Vought Aircraft, the company moved to East Hartford, Connecticut when acquired by a newly formed holding company, United Aircraft and Transport Corporation (UATC). 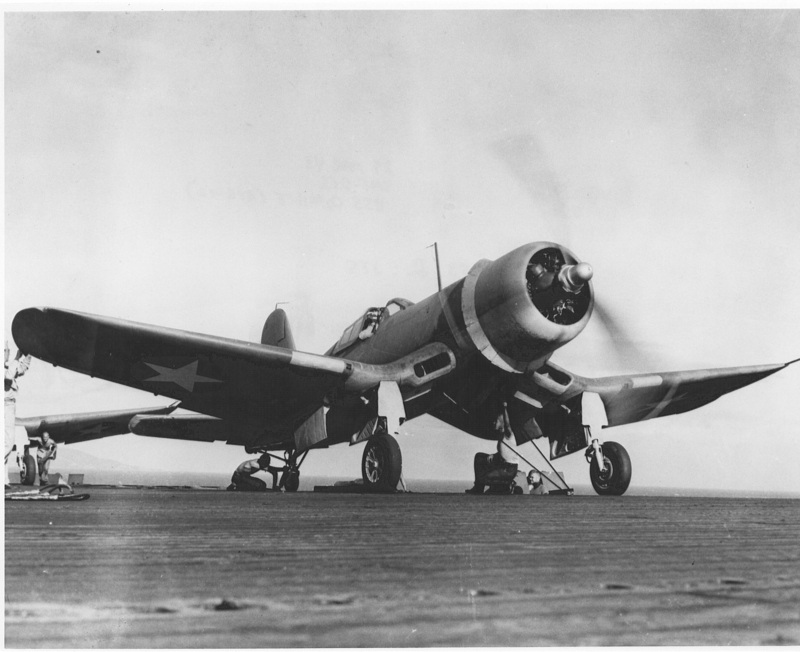 Vought joined other subsidiaries acquired by UATC that included Pratt & Whitney engines, Hamilton Standard propellers, Sikorsky Aircraft, and Boeing Airplane and Transport. 1930 Chance M. Vought dies from septicemia at age 40. F. B. Rentschler (Chairman of UATC) is elected President of the subsidiary. 1934 Under the Air Mail Act of 1934, and new anti-trust laws, UATC is forced to dissolve on September 26, 1934. 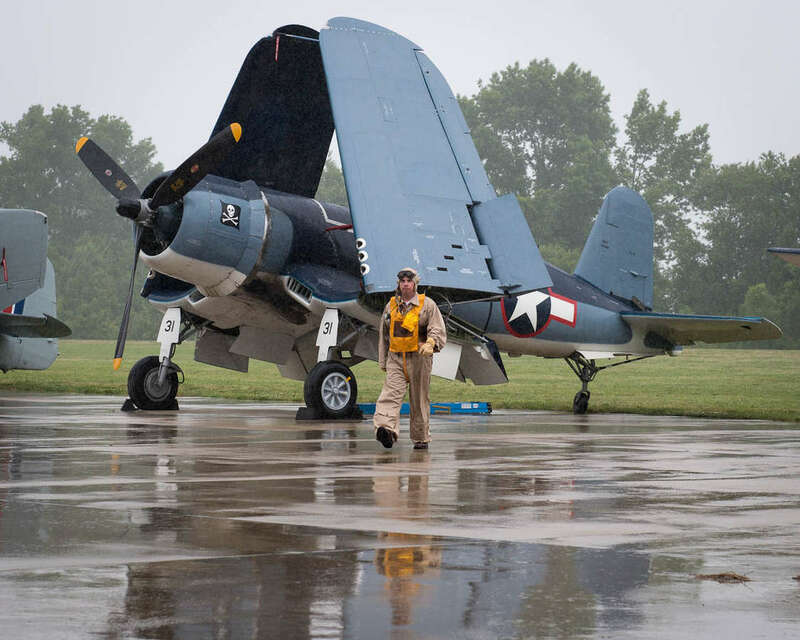 Chance Vought Aircraft becomes part of newly formed United Aircraft Manufacturing Company (UAMC). 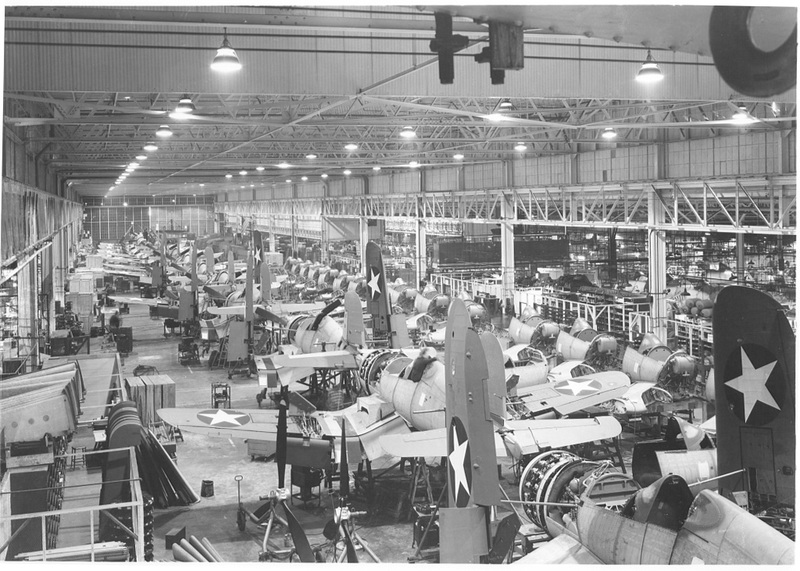 1935 By June, all but Boeing formed the UAMC, part of the new United Aircraft Corporation (UAC). 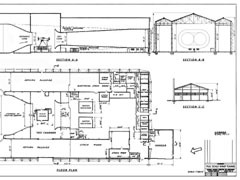 UAMC subsidiaries included Chance Vought Corp., Hamilton Standard Propeller Co., Sikorsky Aircraft Corp., The Pratt & Whitney Aircraft Co., United Aircraft Exports Corp., and The United Airports of Connecticut, Incorporated. UATC's airline interests went on to become United Air Lines (UAL). A separate United Aircraft Exports Corporation (UAEC) was organized. 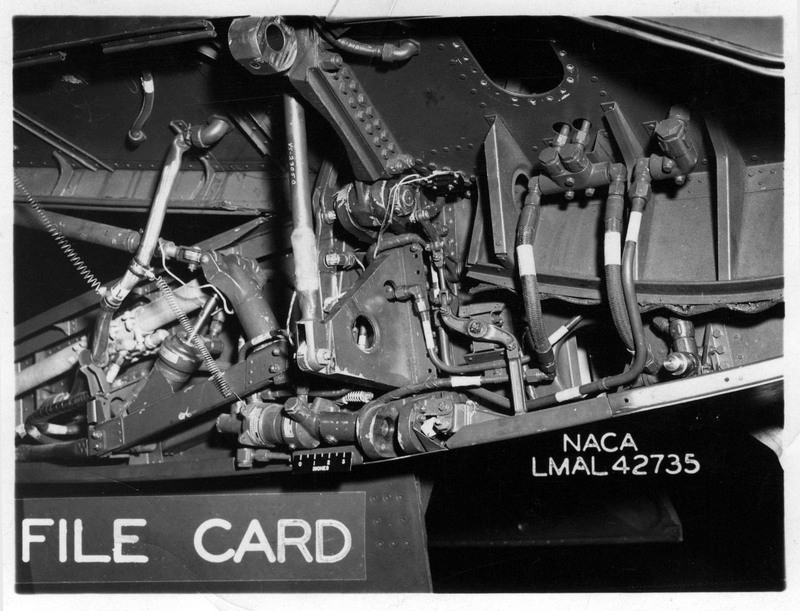 All in turn were subsidiaries of the United Aircraft Corporation (UAC). 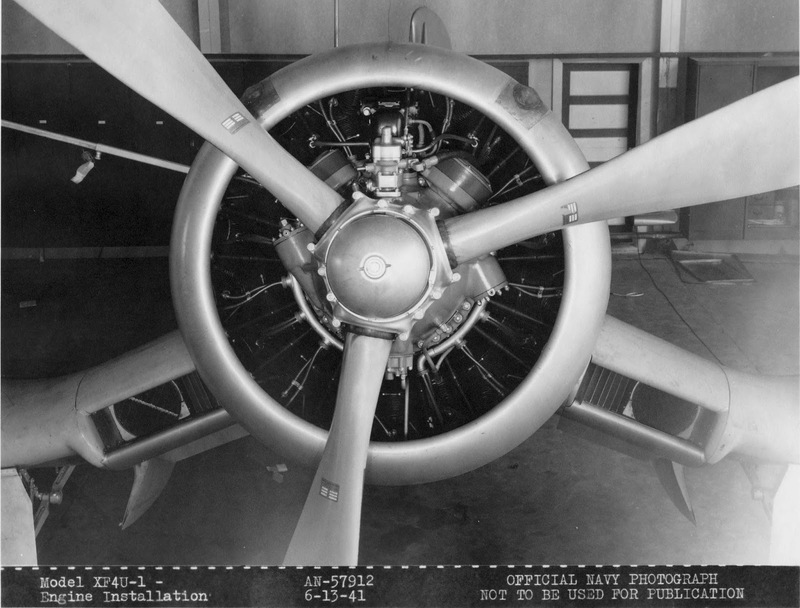 1937 R. W. Clark became general manager of Chance Vought Aircraft and Sikorsky Aircraft divisions. 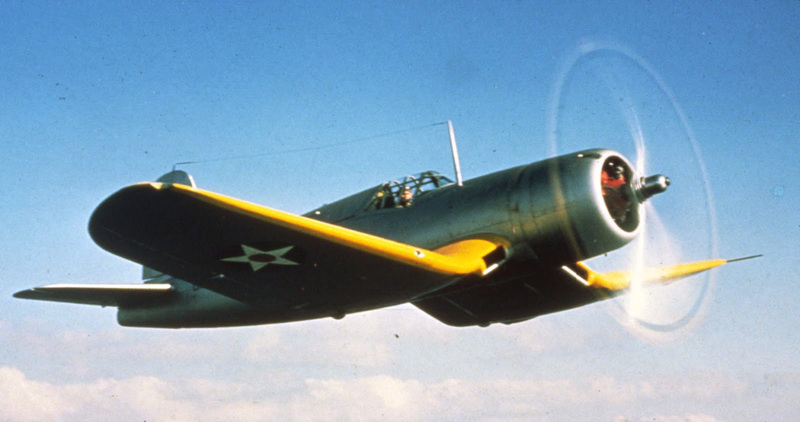 1939 Vought and Sikorsky merged and becomes Vought-Sikorsky Aircraft, and became a single division under UAC. 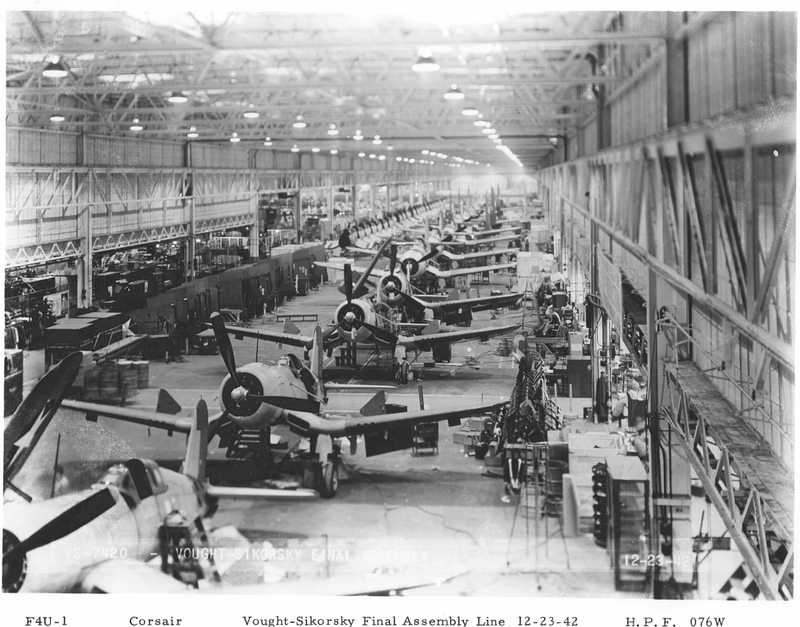 Vought was moved from East Hartford to Stratford, CT, where the larger Sikorsky plant was located. 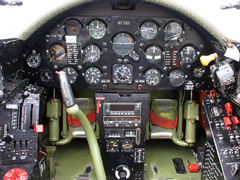 1940 C. J. McCarthy was appointed general manager of Vought-Sikorsky Division. 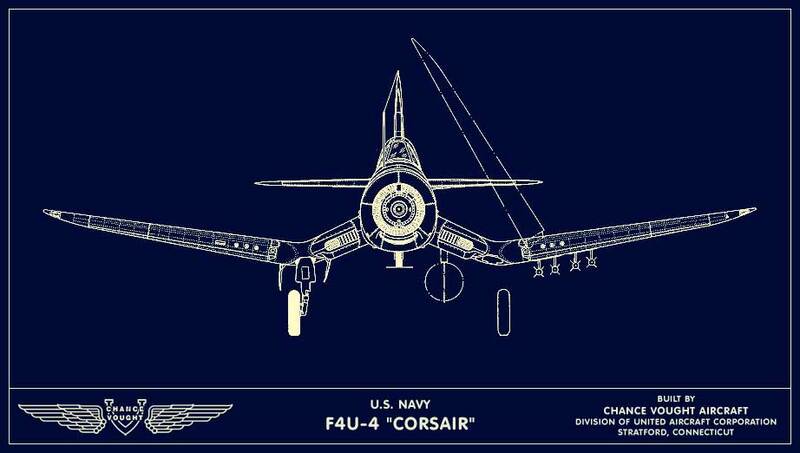 The F4U Corsair first flew on May 29, 1940. 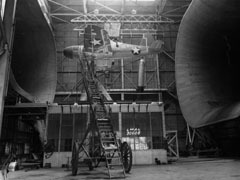 1943 Chance Vought and Sikorsky divisions were reconstituted, with Vought assuming its former title, and Sikorsky moving to a new site in Bridgeport to concentrate on helicopter development and production. 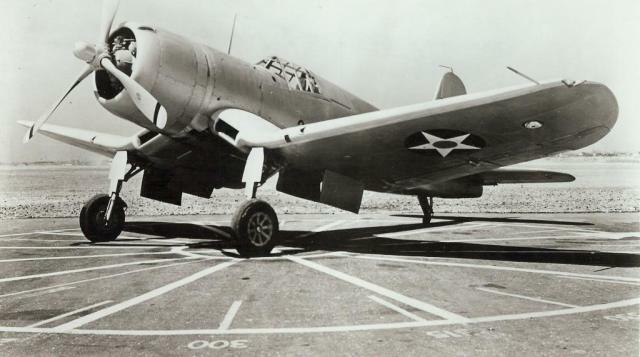 1948 Chance Vought Aircraft moves to Dallas, Texas. Frederick O. Detweiler is named general manager. 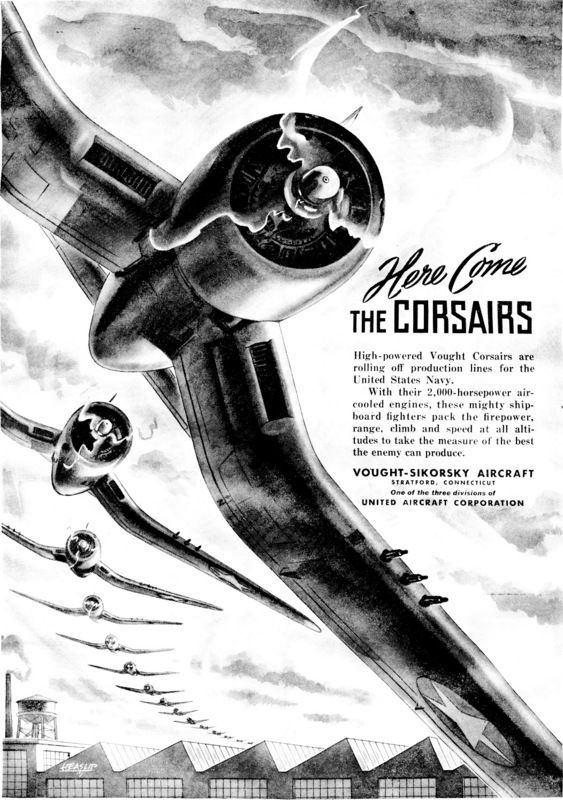 1954 Vought separates from the UAC and becomes an independent corporation again on July 1, 1954. Detweiler becomes president of Chance Vought Aircraft, Incorporated. 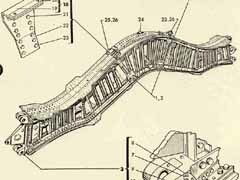 The company was spun off (first as a subsidiary in January 1954) owing to concerns that it might gain unfair advantage from Pratt & Whitney's dealings with other manufacturers. 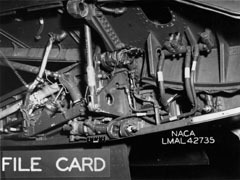 1960 The company became Chance Vought Corporation on December 31, 1960, with its aircraft section called the Aeronautics Division. 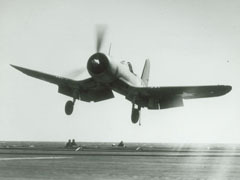 1961 Vought merged with Ling-Temco Electronics and formed Ling-Temco Electronics, Inc., following Vought's failed antitrust suit against Ling. 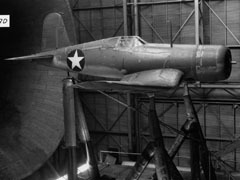 Paul Thayer, a former test pilot, replaced F. O. Detweiler as president of Vought. 1963 The "Chance Vought" name survived until a reorganization of Ling-Temco-Vought (LTV) on October 20, 1963. 1965 Vought Aeronautics formed as a division of LTV Aerospace Corporation, a subsidiary of LTV Incorporated. 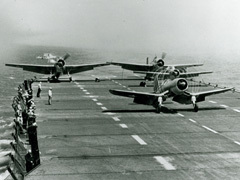 Vought operations comprised the bulk of the division. 1969 The company name was changed from Vought Aeronautics Division to Vought Aeronautics Company, a division of LTV Aerospace Corporation. 1971 Ling-Temco-Vought was renamed LTV Corporation. 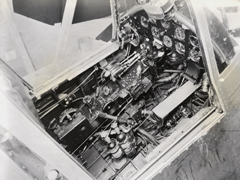 It had three divisions, LTV Aerosystems, LTV Electrosystems, and LTV Ling-Altec. 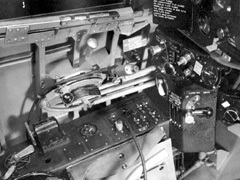 By this time, LTV Aerosystems was comprised of Vought Aeronautics Company, a few other units, and Vought Helicopters, Inc.
1972 The Vought units were reorganized as the Vought Systems Division of LTV Aerospace. 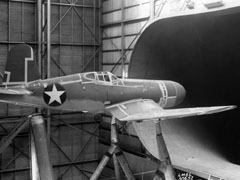 The aircraft producing unit was named the Vought Aeronautics Division. 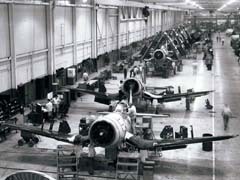 1973 Vought Aeronautics Davison name was changed to Vought Systems Division to reflect its desire to diversify. 1976 All of LTV Aerospace renamed Vought Corporation on January 1, 1976. The parent company LTV Corporation had become a $4 billion diversified conglomerate. 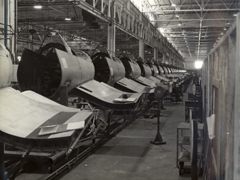 1983 Vought Corporation was again split along aeronautic and missile lines under LTV Aerospace and Defense Company. 1992 Vought and LTV split. 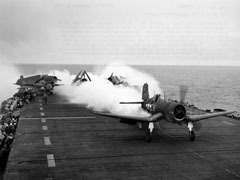 Vought was purchased by Northrop and Carlyle Group, each owning about 50%. 1994 Northrop Grumman, the successor to Northrop and Grumman, bought out Carlyle Group's share of Vought for $130 million. 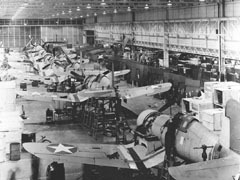 2000 Carlyle Group purchased the entire company from Northrop Grumman and established Vought Aircraft Industries, Inc. Its function was primarily as an aero-structures subcontractor with heavy involvement in the Boeing 747 and 787 as wells as supplying parts for various military aircraft. 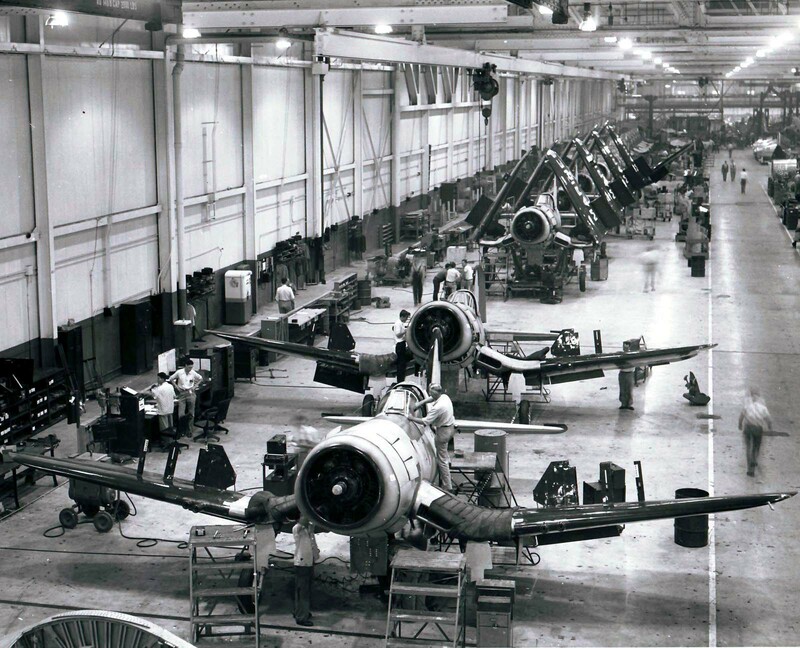 2003 The Aerostructures Corp., owned by the Carlyle Group and based in Nashville, merged with Vought. 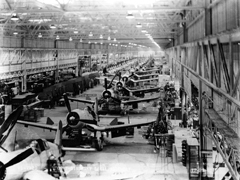 2009 Boeing acquired the Vought Aircraft Industries manufacturing facility, in North Charleston, SC, for $580 million. 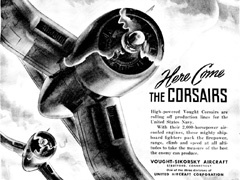 2010 The Carlyle Group sold Vought to the Triumph Group, an aerospace component manufacturer. 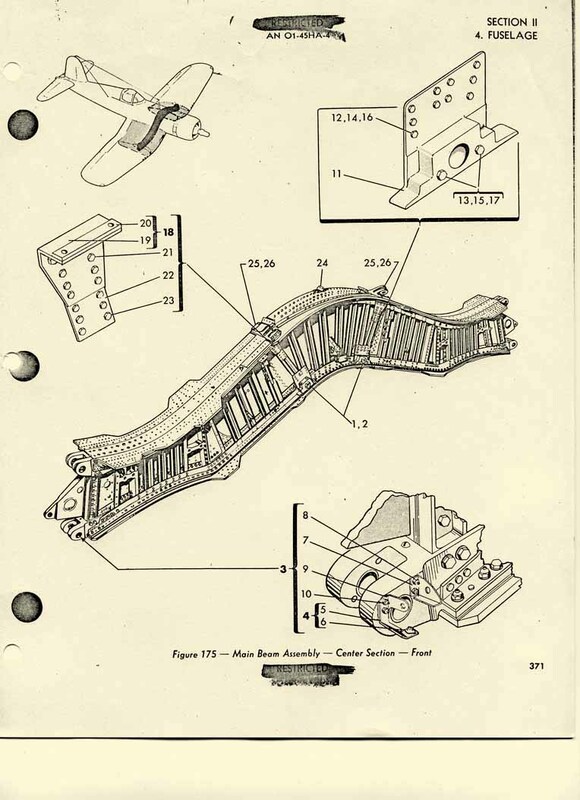 The Vought acquisitions now operate as Triumph Aerostructures - Vought Aircraft Division. 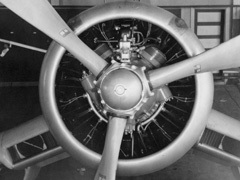 Engine was the first series production variant of the "C" Series, which was a complete redesign of the R-2800. 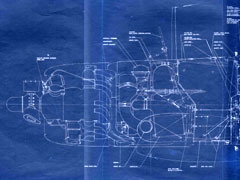 Some of the main changes were forged, rather than cast cylinders, allowing an increased compression ratio (from 6.65:1 to 6.75:1), a redesigned crankshaft, a single piece, rather than split crankcase center section, and a two section nose casing, incorporating hydraulically operated torque-monitoring equipment and an automatic, vacuum operated spark-advance unit. The supercharger used fluid coupling for the second stage. 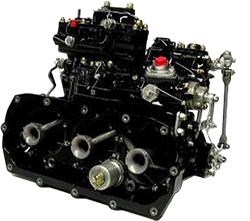 Updraft Bendix-Stromberg PT-13G2-10 carburetor. Production = 3,257 (P&W). 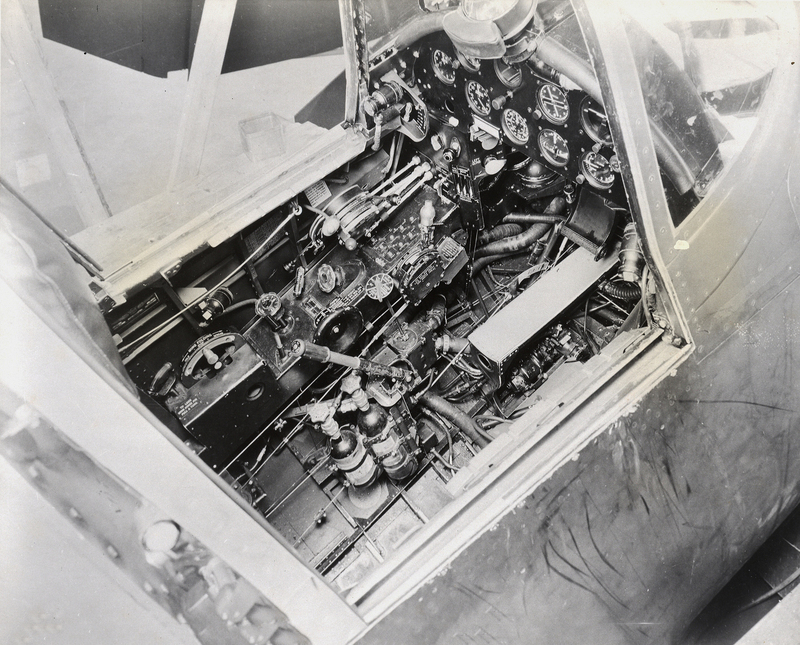 The 18-cylinder twin-row air-cooled radial piston engine was 2,804 cubic inches, supercharged, and water injected. 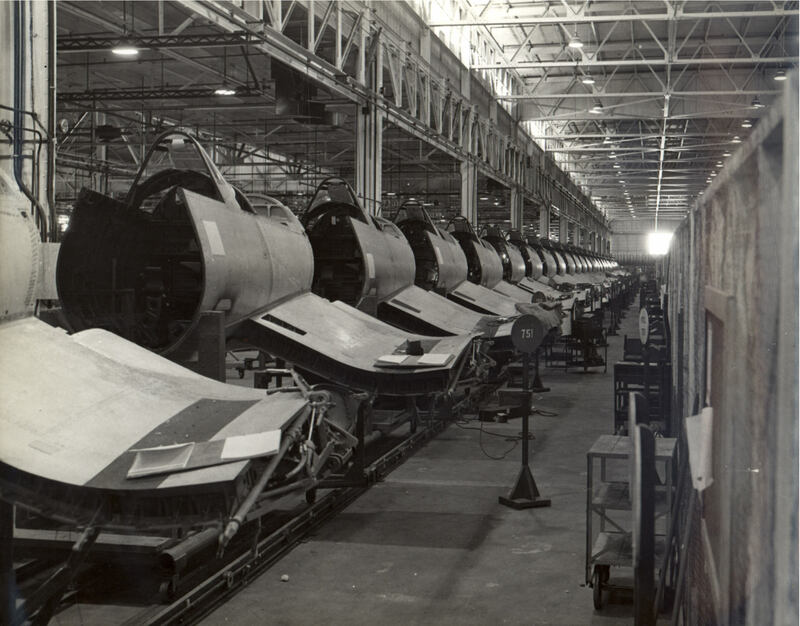 Production of the (P&W) R-2800 "C" Series totaled 3,257. 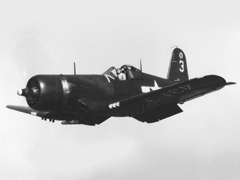 F4U-1 The first production version of the Corsair with the distinctive "bird cage" canopy and low seating position. 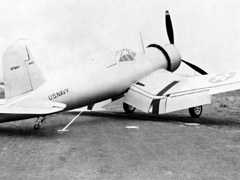 A land-based version for the USMC, without the folding wing capability, was built by Goodyear under the designation FG-1. 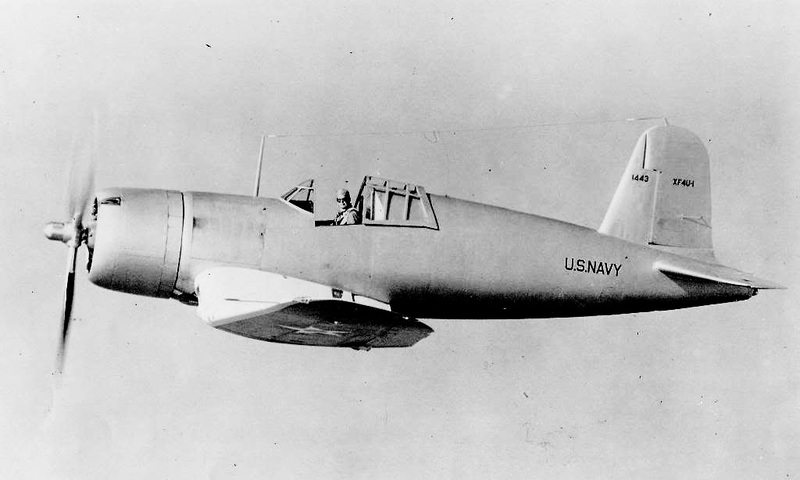 Vought also built a single F4U-1 two-seat trainer; the Navy showed no interest. 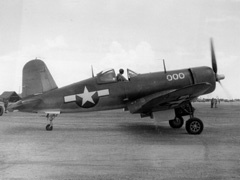 F4U-1A The designation F4U-1A was not officially used. 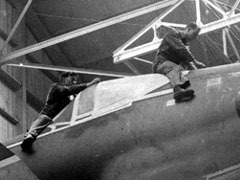 Mid-to-late production Corsairs incorporated a new, taller and wider clear-view canopy with only two frames, along with a simplified clear view windscreen. 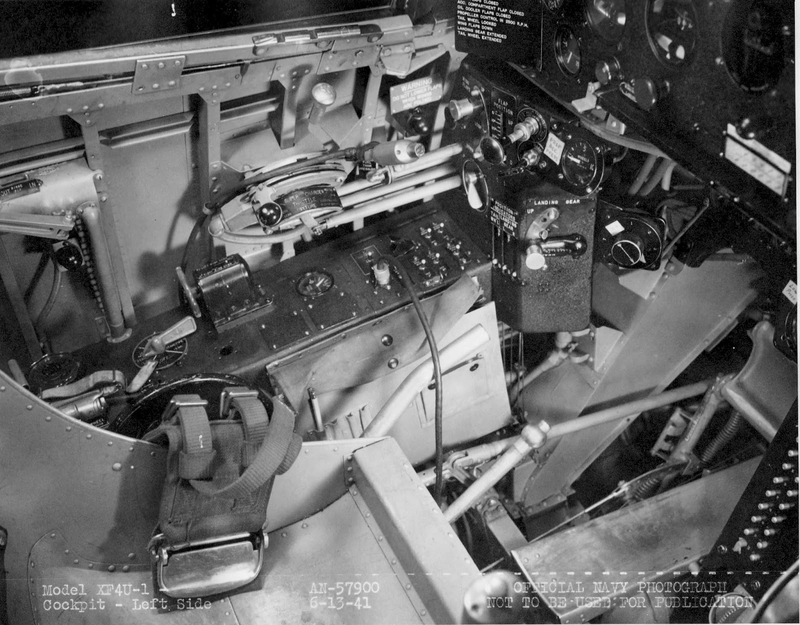 Pilot's seat was raised 7-in., new canopy and lengthened tail wheel strut, allowed better visibility over the long nose. 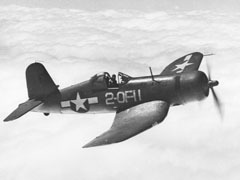 F3A-1 Designation for the Brewster-built F4U-1. Just over 700 produced, before Brewster forced out of business due to production and quality problems. F4U-1B This was an unofficial post-war designation used to identify F4U-1s modified for Fleet Air Arm use. 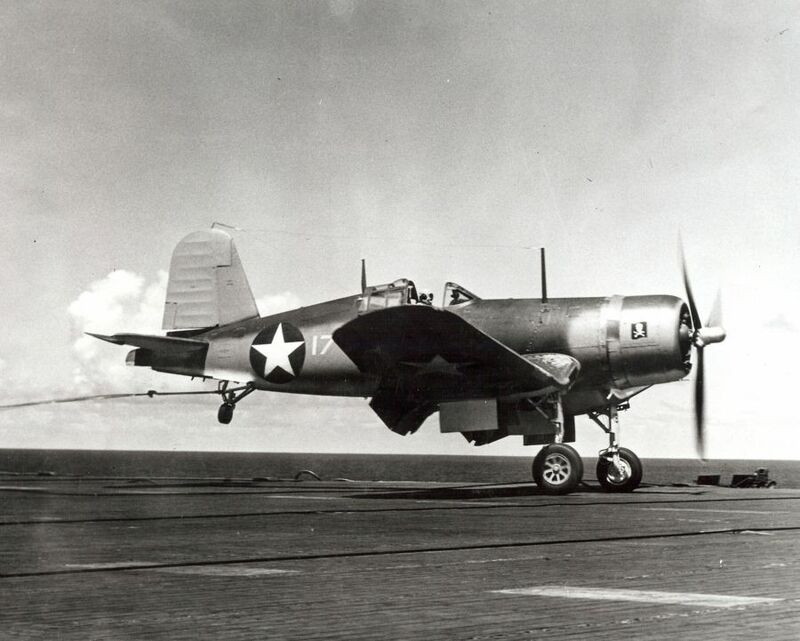 F4U-1C The prototype F4U-1C appeared in August 1943, was based on an F4U-1. 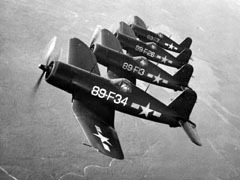 A total of 200 built Jul-Nov 1944; all were based on the F4U-1D. 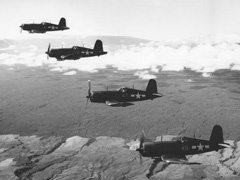 The F4U-1C was introduced to combat during 1945, most notably in the Okinawa campaign. 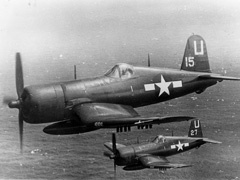 F4U-1D Built in parallel with the F4U-1C, but introduced in April 1944. 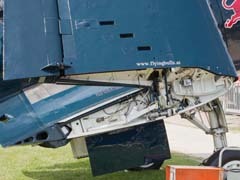 It had the new -18W water-injection engine. 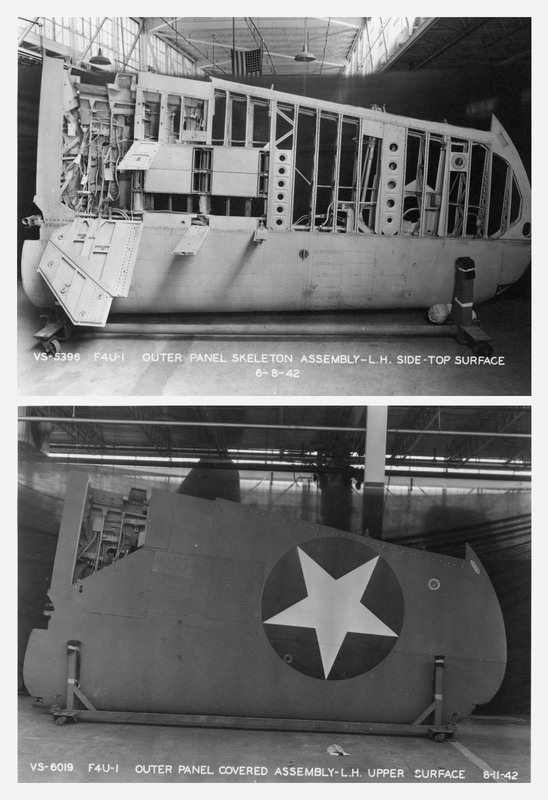 A single piece "blown" clear-view canopy was adopted as standard equipment. 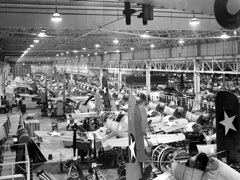 Additional production carried out by Goodyear (FG-1D) and Brewster (F3A-1D). 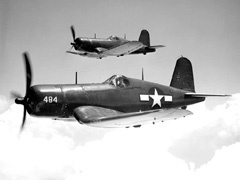 F4U-1P A rare photo reconnaissance variant. XF4U-2 Special night fighter variant, equipped with two auxiliary fuel tanks. 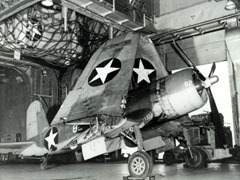 F4U-2 Experimental conversion of the F4U-1 Corsair into a carrier-borne night fighter, and fitted with Airborne Intercept (AI) radar set in a radome placed outboard on the starboard wing. 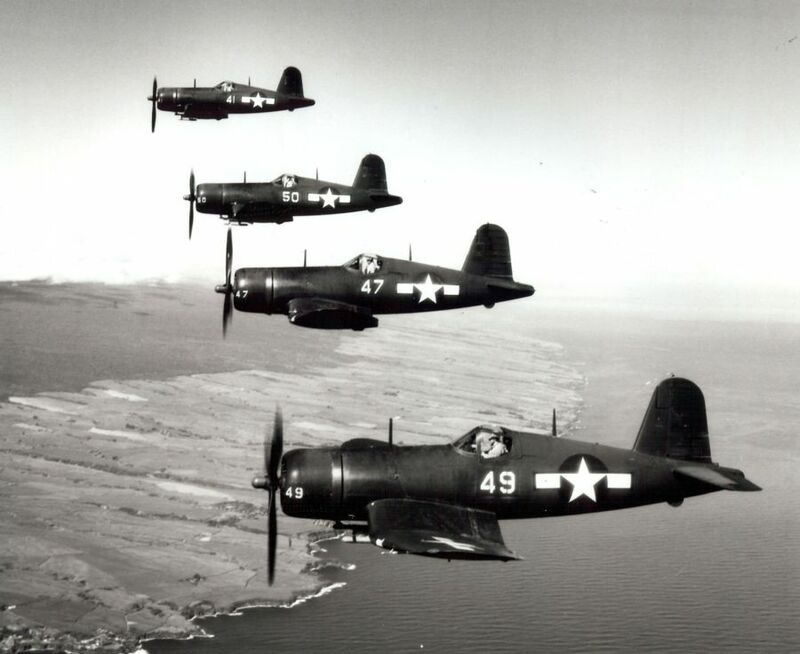 Only 32 were converted from existing F4U-1s by the Naval Aircraft Factory and another two by front line units. 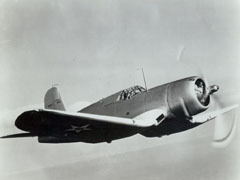 XF4U-3 Experimental aircraft built to hold different engines in order to test Corsair's performance with other engines. This variant never entered service. 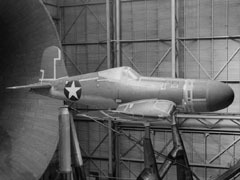 XF4U-4 New engine and cowling. 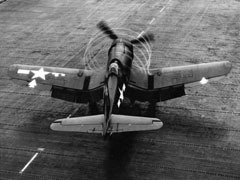 F4U-4 Last variant to see action during World War II, deliveries to the USN began late in 1944. It had the new 2,100 hp, 2-stage supercharged, water injected engine. 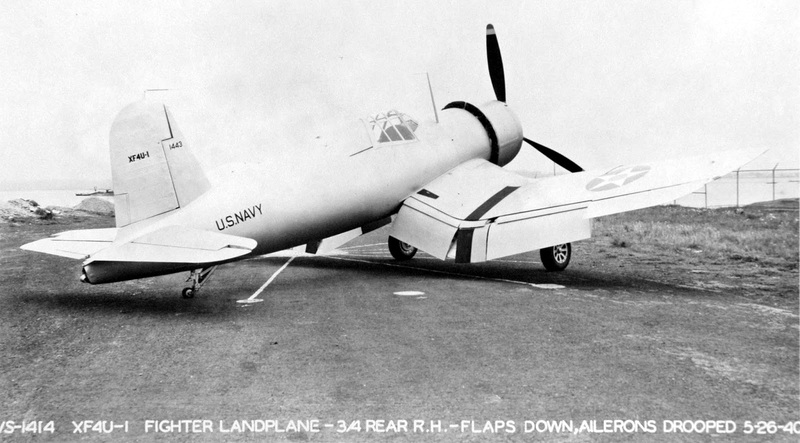 The aircraft required an air scoop under the nose. 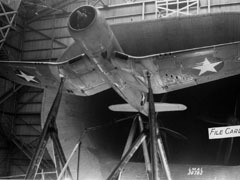 The propeller was changed to a four blade type. 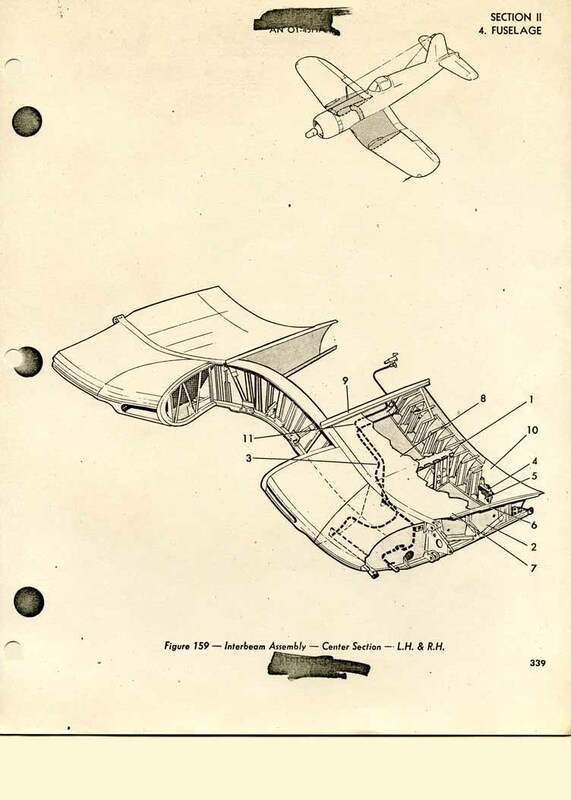 The windscreen changed from curved Plexiglas to flat bullet-resistant glass to avoid optical distortion. 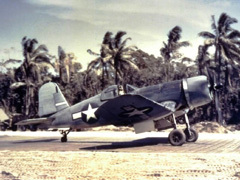 F4U-4B Designation for F4U-4 to be delivered to British Fleet Air Arm, but retained by U.S. for its own use. 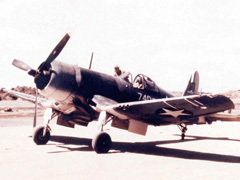 F4U-4C 300 F4U-4s ordered with alternate gun armament. 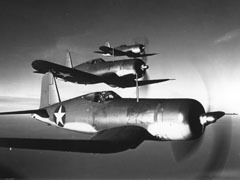 F4U-4N Night fighters with radar radomes projecting from starboard wingtip. 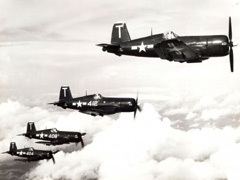 They did not see combat in WWII, but saw great use during Korean war. 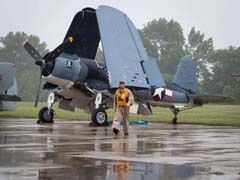 F4U-4P New engine cowling, other extensive changes. 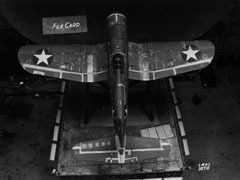 F4U-5 Design modification of F4U-4, first flown on 21 December 1945. 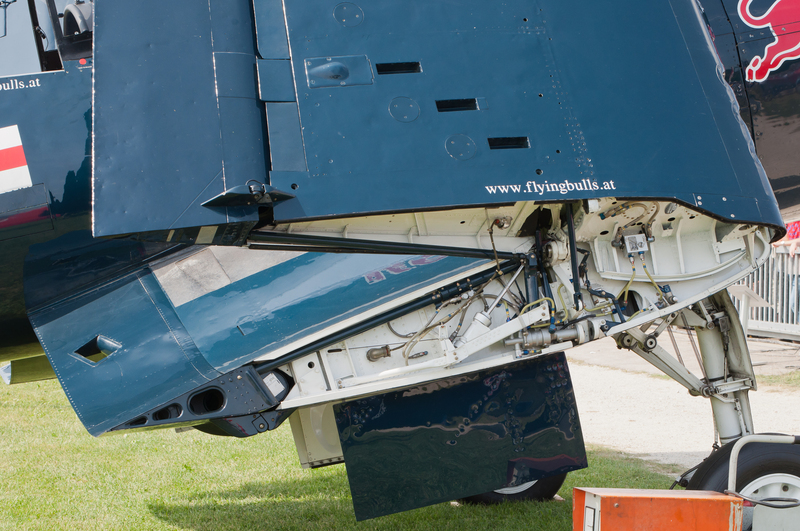 It had new 2,850 hp engine, completely modernized cockpit and fully retractable tail wheel. 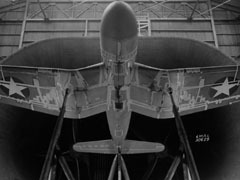 Engine cowling was lowered two degrees to help with forward visibility. 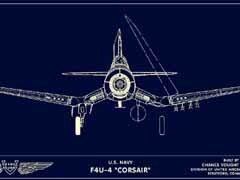 First Corsair to feature all-metal wings (223 units produced). 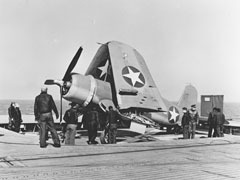 F4U-5NL Winterized version, fitted with rubber de-icing boots on leading edge of wings and tail. 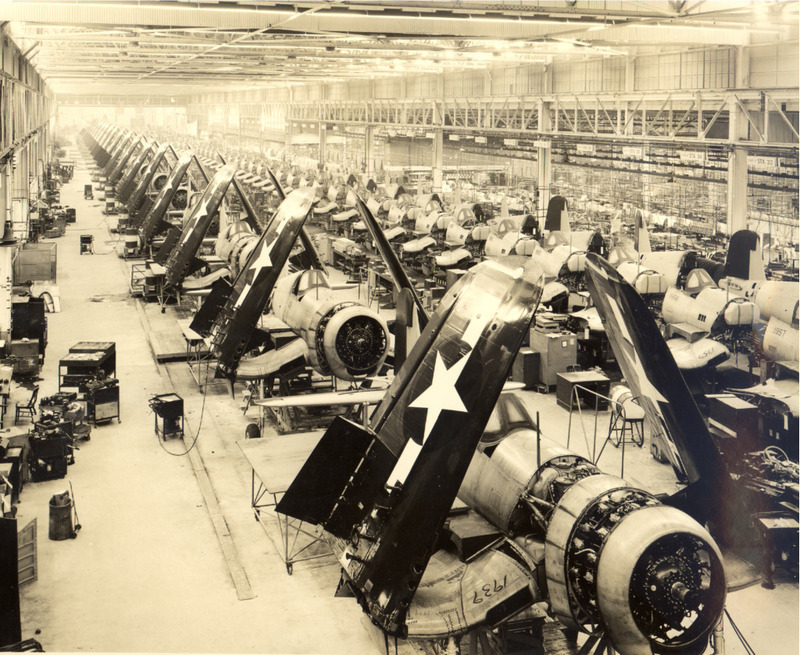 There were 72 units produced, and 29 existing F4U-5N's were modified, totaling 101 planes. F4U-6 Redesignated AU-1, ground-attack version produced for U.S. Marine Corps. 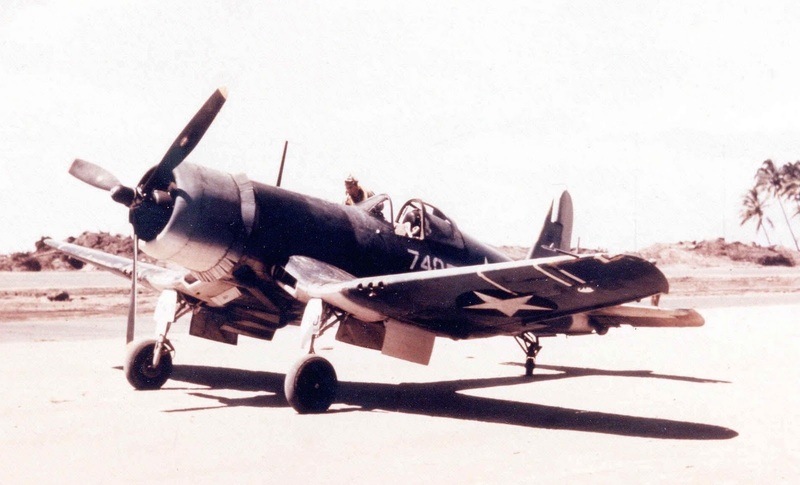 F4U-7 AU-1 developed for the French Navy. 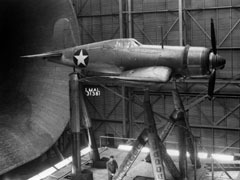 FG-1E Built by Goodyear, it was a FG-1 with radar equipment. 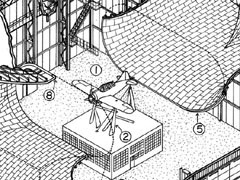 FG-1K Goodyear FG-1 as a drone. 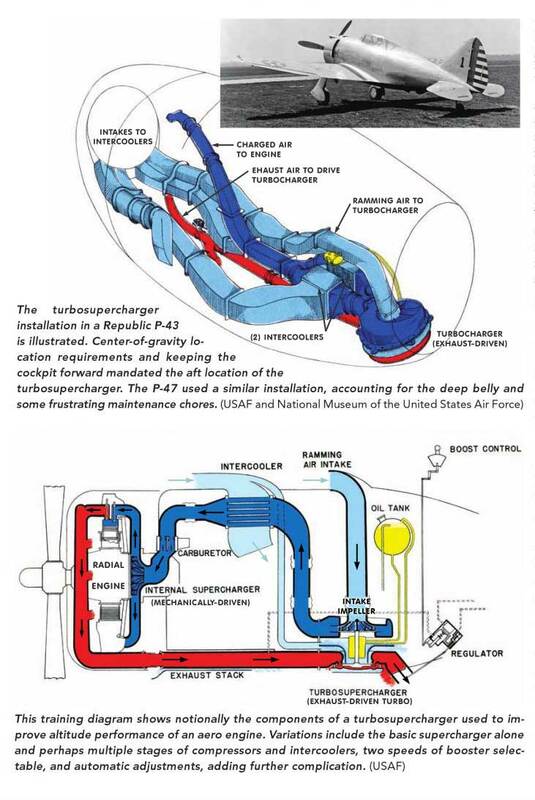 FG-3 Goodyear, a turbo-supercharger version converted from FG-1D. 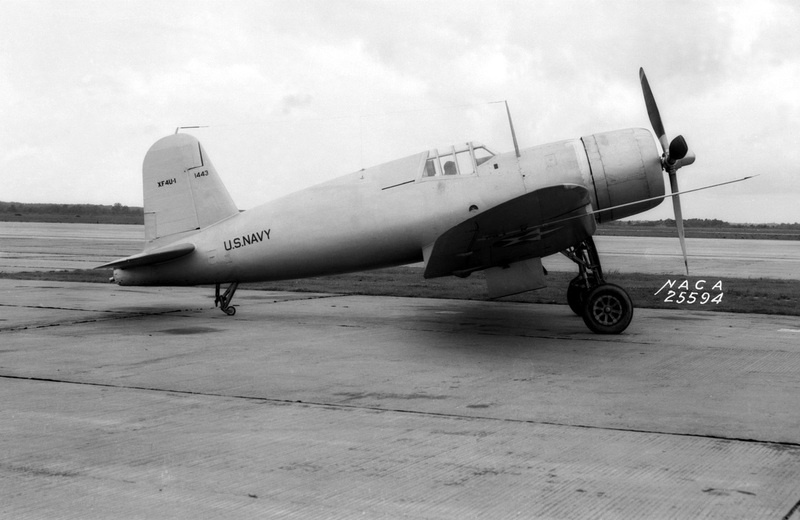 FG-4 Goodyear F4U-4, never delivered. 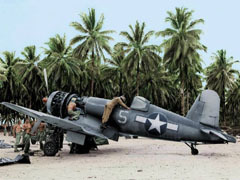 AU-1 A U.S. Marines attack variant with extra armor to protect pilot and fuel tank. Oil coolers relocated inboard to reduce vulnerability to ground fire. 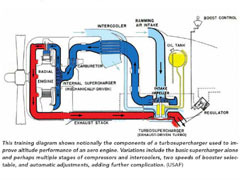 Supercharger was simplified for low altitude operation. First produced in 1952 and used in Korea, and retired in 1957. 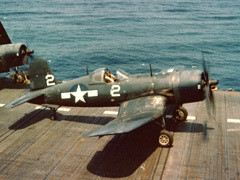 Re-designated from F4U-6. 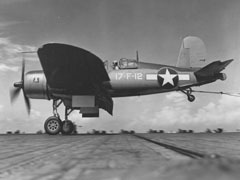 F2G The Goodyear F2G "Super" Corsair was a development by the Goodyear Aircraft Company of the FG-1/F4U-1 Corsair design. 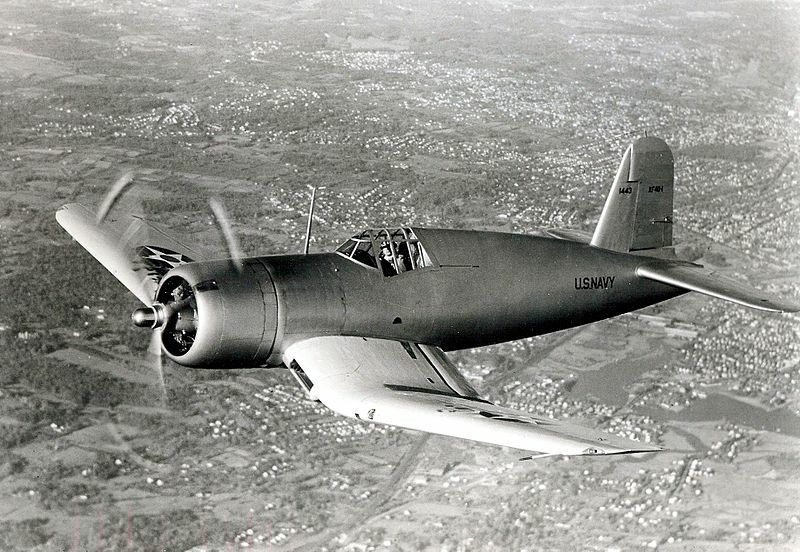 It was a special low-altitude version of a fighter equipped with the Pratt & Whitney R-4360 Wasp Major four-row 28-cylinder "corncob" air-cooled radial engine and teardrop (bubble) canopy. 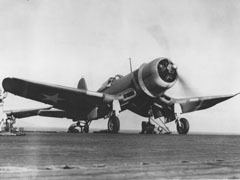 The F2G-1 variant featured a manual folding wing and 14 ft propellers, while the F2G-2 aircraft had hydraulic operated folding wings, 13 ft propellers and carrier arresting hooks for carrier use. Development was discontinued as World War II was drawing to a close. 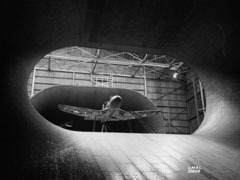 In 1931, work was completed on what was then the world's largest wind tunnel with a 30-ft by 60-ft test section, known as the Langley Full Scale Tunnel. 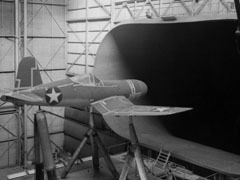 Designed by Langley staff, the tunnel could study entire full-sized aircraft of the time and was instrumental in doing drag clean-up studies for nearly every U.S. 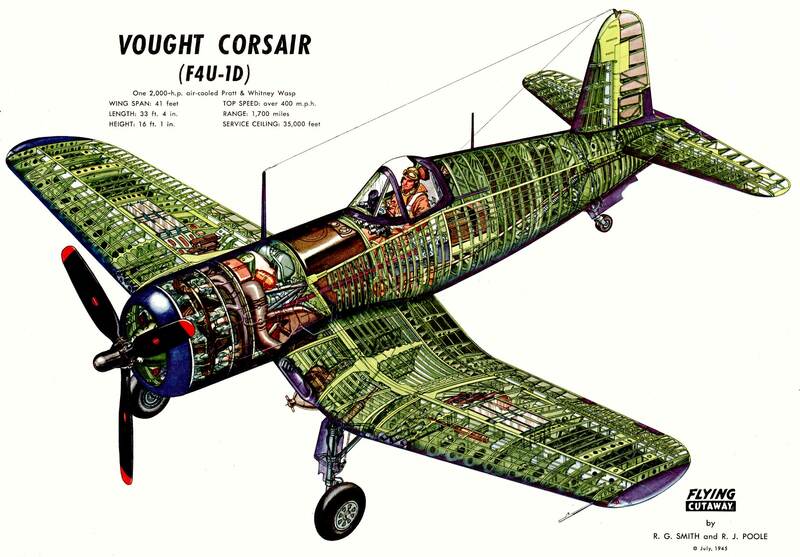 Fighter aircraft design in the World War II era. 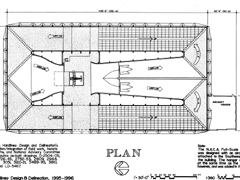 The Full Scale Tunnel went on to test the Mercury space capsule, the lunar lander test vehicle, F-16, concepts for super sonic transports, and the space shuttle. This tunnel was also designated a National Historic Landmark, but has since been declared obsolete and demolished. 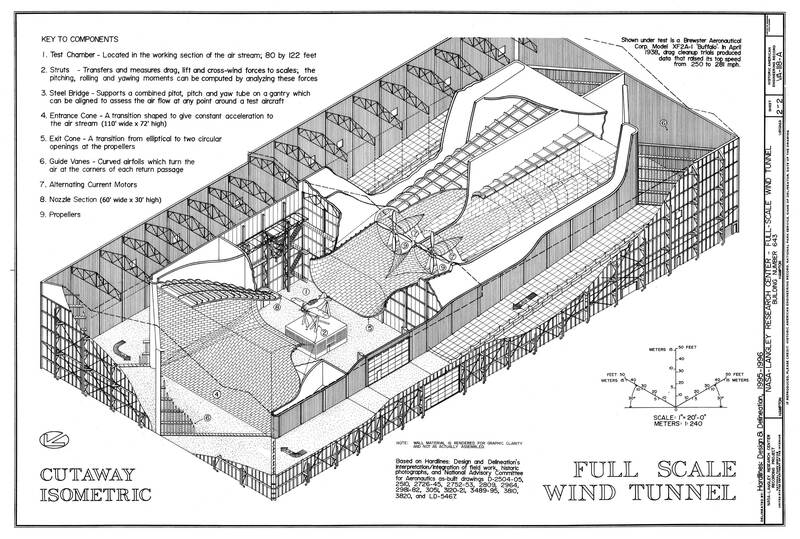 NASA-Langley Research Center Recording Project. 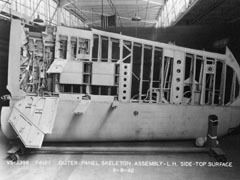 Historic American Engineering Record. National Park Service. U.S. Dept. of the Interior. (1995-96).